Visitors to this year’s MEDICA event in Düsseldorf experienced innovation by Sony that enhances hospitals’ imaging workflow in Full HD, 4K and HDR. Alongside our NUCLeUS™ video-over-IP platform, show highlights included the latest solutions for image capture, display and documentation. Centre stage at this year’s MEDICA was NUCLeUS™, Sony’s video-over-IP platform that enhances hospital-wide medical image workflow. Scalable and vendor neutral, NUCLeUS™ streamlines the display, recording and distribution of surgical images with uncompromised quality and exceptional flexibility. Other MEDICA product highlights included our brand-new 3-chip CMOS Full HD medical camera that supports HDR and takes sensitivity to the next level. Our new 27-inch 4K surgical monitor outperforms conventional displays with spectacular detail, wide colour gamut, high contrast and 800 cd/m2 panel brightness – ideal for viewing surgical content from an HDR capable camera. Our unique upscaling technology allows the monitor to display content from HD modalities and cameras as well. After a recent firmware update, the HVO-4000MT 4K 2D & 3D medical video recorder now features DICOM Modality Worklist support and an HD input. We also demonstrated the benefits of our 4K and 3D imaging workflow in real-world surgical applications. Explore the exciting range of new products and innovations showcased at this year’s MEDICA. We’re leading the way with our innovative 4K3D surgical imaging solutions. At MEDICA we showcased the potential of 4K3D image acquisition and display in applications including heads-up microsurgery. We also revealed our advanced technology inside the world’s first native 4K 3-chip external camera designed for use in the operating room with surgical microscopes. Clinicians worldwide depend on our reliable, high-performance medical recorders and printers to enhance ultrasound and surgical workflows. Find out how we’re supporting hospitals in a wide range of training and education applications with our documentation solutions. At MEDICA we also showed our space-saving wireless printing solution that allows convenient, cable-free connection between a modality and off-cart printer. Virtual Reality (VR) offers exciting possibilities to enhance the quality of medical training and education. 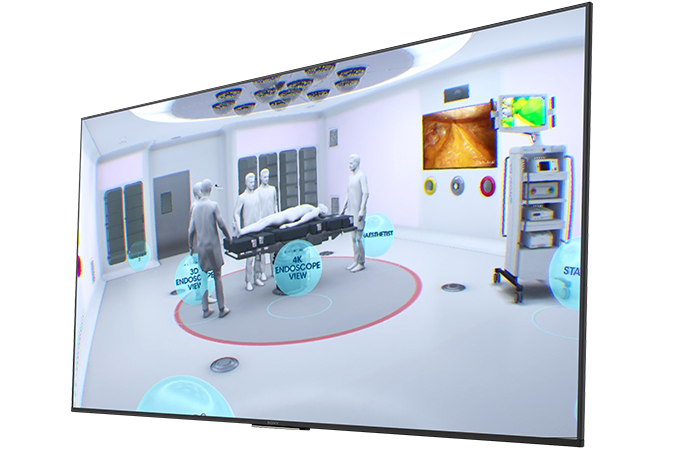 At MEDICA this year we showcased our proof-of-concept solution to demonstrate the application of VR. Furthermore, we highlighted our NUCLeUS™ smart application ‘Telestration’. Together, these powerful tools could help surgeons and other clinical staff across the hospital campus.